Prime Minister Narendra Modi capped off the last day of his three-day Singapore visit with a tour of the Singapore Navy’s Changi Naval Base. Prime Minister Narendra Modi capped off the last day of his three-day Singapore visit with a trip to the Changi Naval Base of Republic of Singapore Navy (RSN). At the Base, the PM boarded the Indian Navy ship INS Satpura, which is currently visiting Singapore. The Prime Minister was accompanied by Singapore’s Senior Minister of State for Defence Mohamad Maliki Osman. At the Base, the PM was welcomed by a Colonel-rank officer (Indian equivalent of Commodore) of the Republic of Singapore Navy and was accorded a guard of honour. 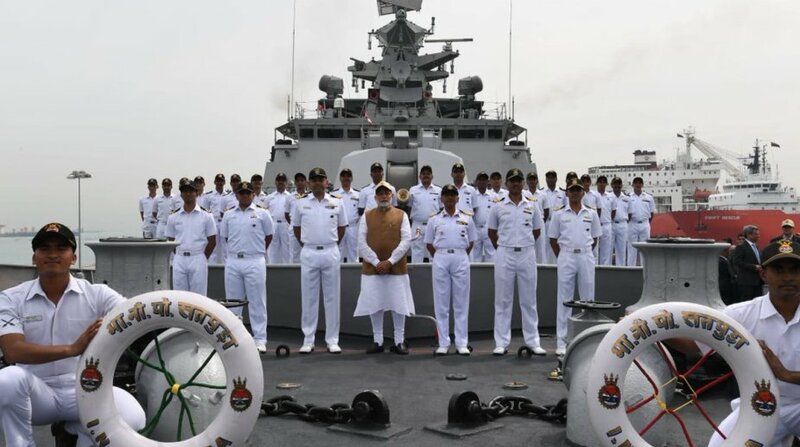 Following a tour of RSS Formidable, the lead ship of the Formidable-class multi-role stealth frigates, the PM went on-board INS Satpura and met commanders and officers of the ship. “25 years of uninterrupted naval exercises and growing naval cooperation! PM @narendramodi with Senior Minister of State for Defence Md. Maliki Osman and other dignitaries on-board the RSS Formidable Frigate of the Singapore Navy,” External Affairs Ministry Raveesh Kumar tweeted. On INS Satpura, the PM was shown around the Shivalik-class stealth multi-role frigate which was commissioned into the Indian Navy in 2011. “Proud to be with our naval sentinels! PM @narendramodi on board INS Satpura which is visiting the Changi Naval Base as part of its deployment in the region. A fitting finale to a memorable visit to Singapore! ” Kumar tweeted. Changi Naval Base was the last stop in the itinerary of the Prime Minister who would now be leaving for New Delhi. India and Singapore signed eight Memorandum of Understanding (MoU) including a strategically significant implementation agreement between Indian Navy and Republic of Singapore Navy. On 1 June, the second day of the three-day visit of Prime Minister Narendra Modi to the city state, the navies of the two nations agreed on logistical support for naval ships, submarines and naval aircraft, including Ship borne Aviation Assets, during visits. Mutual coordination and services support are part of the Implementation agreement signed between Indian Navy and Singaporean Navy. “India’s armed forces, especially our Navy, are building partnerships in the Indo-Pacific region for peace and security, as well as humanitarian assistance and disaster relief,” Modi had said on Friday.